1. Mix the cornstarch, egg white, 1/4 tsp salt and rice wine in a bowl. 2. Marinate the chicken cubes in this mixture for 15 to 30 minutes in a fridge. 3. Mix the oyster sauce, water and brown sugar in a bowl. 5. Add 1 cup of oil and add the marinated chicken cubes. 6. Stir-fry for about 15 to 30 seconds. 8. Leave 3/4 tblsp of oil in the pan and remove the rest. 9. Stir-fry the ginger and add the broccoli. 10. Add salt to taste and stir-fry for a minute. 11. Add the chicken cubes and stir-fry for one more minute. 12. Add the sauce and cook for 1 to 2 minutes. image credit: new asian cuisine. 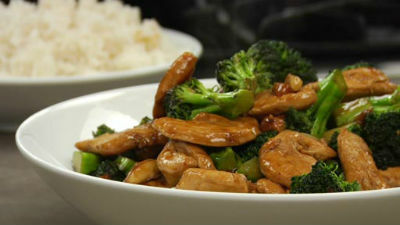 Feel free to comment or share your thoughts on this Broccoli Chicken Recipe from Awesome Cuisine.